This article is about a city in Myanmar. For other uses, see Bagan (disambiguation). Bagan (Burmese: ပုဂံ; MLCTS: pu.gam, IPA: [bəɡàɴ]; formerly Pagan) is an ancient city located in the Mandalay Region of Myanmar. From the 9th to 13th centuries, the city was the capital of the Pagan Kingdom, the first kingdom that unified the regions that would later constitute modern Myanmar. During the kingdom's height between the 11th and 13th centuries, over 10,000 Buddhist temples, pagodas and monasteries were constructed in the Bagan plains alone, of which the remains of over 2,200 temples and pagodas still survive to the present day. The Bagan Archaeological Zone is a main attraction for the country's nascent tourism industry. It is seen by many as equal in attraction to Angkor Wat in Cambodia. Bagan is the present-day standard Burmese pronunciation of the Burmese word Pugan (ပုဂံ), derived from Old Burmese Pukam (ပုကမ်). Its classical Pali name is Arimaddanapura (အရိမဒ္ဒနာပူရ, lit. "the City that Tramples on Enemies"). 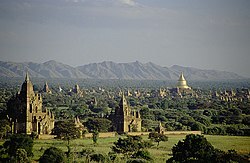 Its other names in Pali are in reference to its extreme dry zone climate: Tattadesa (တတ္တဒေသ, "parched land"), and Tampadīpa (တမ္ပဒီပ, "bronzed country"). The Burmese chronicles also report other classical names of Thiri Pyissaya (သီရိပစ္စယာ; Pali: Siripaccaya) and Tampawaddy (တမ္ပဝတီ; Pali: Tampavatī). According to the Burmese chronicles, Bagan was founded in the second century AD, and fortified in 849 AD by King Pyinbya, 34th successor of the founder of early Bagan. Mainstream scholarship however holds that Bagan was founded in the mid-to-late 9th century by the Mranma (Burmans), who had recently entered the Irrawaddy valley from the Nanzhao Kingdom. It was among several competing Pyu city-states until the late 10th century when the Burman settlement grew in authority and grandeur. From 1044 to 1287, Bagan was the capital as well as the political, economic and cultural nerve center of the Pagan Empire. Over the course of 250 years, Bagan's rulers and their wealthy subjects constructed over 10,000 religious monuments (approximately 1000 stupas, 10,000 small temples and 3000 monasteries) in an area of 104 square kilometres (40 sq mi) in the Bagan plains. The prosperous city grew in size and grandeur, and became a cosmopolitan center for religious and secular studies, specializing in Pali scholarship in grammar and philosophical-psychological (abhidhamma) studies as well as works in a variety of languages on prosody, phonology, grammar, astrology, alchemy, medicine, and legal studies. The city attracted monks and students from as far as India, Sri Lanka and the Khmer Empire. The Pagan Empire collapsed in 1287 due to repeated Mongol invasions (1277–1301). Recent research shows that Mongol armies may not have reached Bagan itself, and that even if they did, the damage they inflicted was probably minimal. However, the damage had already been done. The city, once home to some 50,000 to 200,000 people, had been reduced to a small town, never to regain its preeminence. The city formally ceased to be the capital of Burma in December 1297 when the Myinsaing Kingdom became the new power in Upper Burma. Bagan survived into the 15th century as a human settlement, and as a pilgrimage destination throughout the imperial period. A smaller number of "new and impressive" religious monuments still went up to the mid-15th century but afterward, new temple constructions slowed to a trickle with fewer than 200 temples built between the 15th and 20th centuries. The old capital remained a pilgrimage destination but pilgrimage was focused only on "a score or so" most prominent temples out of the thousands such as the Ananda, the Shwezigon, the Sulamani, the Htilominlo, the Dhammayazika, and a few other temples along an ancient road. The rest—thousands of less famous, out-of-the-way temples—fell into disrepair, and most did not survive the test of time. For the few dozen temples that were regularly patronized, the continued patronage meant regular upkeep as well as architectural additions donated by the devotees. Many temples were repainted with new frescoes on top of their original Pagan era ones, or fitted with new Buddha statutes. Then came a series of state-sponsored "systematic" renovations in the Konbaung period (1752–1885), which by and large were not true to the original designs—some finished with "a rude plastered surface, scratched without taste, art or result". The interiors of some temples were also whitewashed, such as the Thatbyinnyu and the Ananda. Many painted inscriptions and even murals were added in this period. Bagan, located in an active earthquake zone, had suffered from many earthquakes over the ages, with over 400 recorded earthquakes between 1904 and 1975. A major earthquake occurred on 8 July 1975, reaching 8 MM in Bagan and Myinkaba, and 7 MM in Nyaung-U. The quake damaged many temples, in many cases, such as the Bupaya, severely and irreparably. Today, 2229 temples and pagodas remain. Many of these damaged pagodas underwent restorations in the 1990s by the military government, which sought to make Bagan an international tourist destination. However, the restoration efforts instead drew widespread condemnation from art historians and preservationists worldwide. Critics are aghast that the restorations paid little attention to original architectural styles, and used modern materials, and that the government has also established a golf course, a paved highway, and built a 61-meter (200-foot) watchtower. Although the government believed that the ancient capital's hundreds of (unrestored) temples and large corpus of stone inscriptions were more than sufficient to win the designation of UNESCO World Heritage Site, the city has not been so designated, allegedly mainly on account of the restorations. Bagan today is a main tourist destination in the country's nascent tourism industry, which has long been the target of various boycott campaigns. 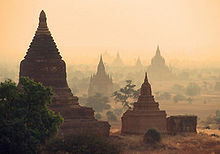 The majority of over 300,000 international tourists to the country in 2011 are believed to have also visited Bagan. Several Burmese publications note that the city's small tourism infrastructure will have to expand rapidly even to meet a modest pickup in tourism in the following years. On 24 August 2016, a major earthquake hit central Burma and again did major damage in Bagan; this time almost 400 temples were destroyed. The Sulamani and Myauk Guni (North Guni) were severely damaged. The Bagan Archaeological Department has started a survey and reconstruction effort with the help of UNESCO experts. Visitors are prohibited from entering 33 damaged temples. The Bagan Archaeological Zone, defined as the 13 x 8 km area centred around Old Bagan, consisting of Nyaung U in the north and New Bagan in the south, lies in the vast expanse of plains in Upper Burma on the bend of the Irrawaddy river. 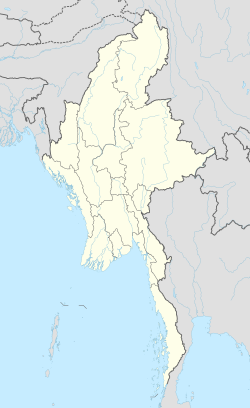 It is located 290 kilometres (180 mi) south-west of Mandalay and 700 kilometres (430 mi) north of Yangon. Its coordinates are 21°10' North and 94°52' East. Bagan lies in the middle of the "dry zone" of Burma, the region roughly between Shwebo in the north and Pyay in the south. Unlike the coastal regions of the country, which receive annual monsoon rainfalls exceeding 2500 mm, the dry zone gets little precipitation as it is sheltered from the rain by the Rakhine Yoma mountain range in the west. Available online climate sources report Bagan climate quite differently. Bagan Plains, as seen from across the Irrawaddy river. Bagan stands out for not only the sheer number of religious edifices of Myanmar but also the magnificent architecture of the buildings, and their contribution to Burmese temple design. The artistry of the architecture of pagodas in Bagan proves the achievement of Myanmar craftsmen in handicrafts. The Bagan temple falls into one of two broad categories: the stupa-style solid temple and the gu-style (ဂူ) hollow temple. A stupa, also called a pagoda, is a massive structure, typically with a relic chamber inside. The Bagan stupas or pagodas evolved from earlier Pyu designs, which in turn were based on the stupa designs of the Andhra region, particularly Amaravati and Nagarjunakonda in present-day south-eastern India, and to a smaller extent to Ceylon. The Bagan-era stupas in turn were the prototypes for later Burmese stupas in terms of symbolism, form and design, building techniques and even materials. Originally, a Ceylonese stupa had a hemispheric body (Pali: anda "the egg"), on which a rectangular box surrounded by a stone balustrade (harmika) was set. Extending up from the top of the stupa was a shaft supporting several ceremonial umbrellas. The stupa is a representation of the Buddhist cosmos: its shape symbolizes Mount Meru while the umbrella mounted on the brickwork represents the world's axis. The brickwork pediment was often covered in stucco and decorated in relief. Pairs or series of ogres as guardian figures ('bilu') were a favourite theme in the Bagan period. The original Indic design was gradually modified first by the Pyu, and then by Burmans at Bagan where the stupa gradually developed a longer, cylindrical form. The earliest Bagan stupas such as the Bupaya (c. 9th century) were the direct descendants of the Pyu style at Sri Ksetra. By the 11th century, the stupa had developed into a more bell-shaped form in which the parasols morphed into a series of increasingly smaller rings placed on one top of the other, rising to a point. On top the rings, the new design replaced the harmika with a lotus bud. The lotus bud design then evolved into the "banana bud", which forms the extended apex of most Burmese pagodas. Three or four rectangular terraces served as the base for a pagoda, often with a gallery of terra-cotta tiles depicting Buddhist jataka stories. The Shwezigon Pagoda and the Shwesandaw Pagoda are the earliest examples of this type. Examples of the trend toward a more bell-shaped design gradually gained primacy as seen in the Dhammayazika Pagoda (late 12th century) and the Mingalazedi Pagoda (late 13th century). In contrast to the stupas, the hollow gu-style temple is a structure used for meditation, devotional worship of the Buddha and other Buddhist rituals. The gu temples come in two basic styles: "one-face" design and "four-face" design—essentially one main entrance and four main entrances. Other styles such as five-face and hybrids also exist. The one-face style grew out of 2nd century Beikthano, and the four-face out of 7th century Sri Ksetra. The temples, whose main features were the pointed arches and the vaulted chamber, became larger and grander in the Bagan period. Another architectural innovation originated in Bagan is the Buddhist temple with a pentagonal floor plan. This design grew out of hybrid (between one-face and four-face designs) designs. The idea was to include the veneration of the Maitreya Buddha, the future and fifth Buddha of this era, in addition to the four who had already appeared. The Dhammayazika and the Ngamyethna Pagoda are examples of the pentagonal design. The Bagan Archaeological Museum: The only museum in the Bagan Archaeological Zone, itself a field museum a millennium old. The three-story museum houses a number of rare Bagan period objects including the original Myazedi inscriptions, the Rosetta stone of Burma. Anawrahta's Palace: It was rebuilt in 2003 based on the extant foundations at the old palace site. But the palace above the foundation is completely conjectural. Bagan is accessible by air, rail, bus, car and river boat. Most international tourists fly to the city. The Nyaung U Airport is the gateway to the Bagan region. Several domestic airlines have regular flights to Yangon, which take about 80 minutes to cover the 600 kilometres. Flights to Mandalay take approximately 30 minutes and to Heho about 40 minutes. The airport is located on the outskirts of Nyaung U and it takes about 20 minutes by taxi to reach Bagan. The city is on a spur from the Yangon-Mandalay rail line. Myanmar Railways operates a daily overnight train service each way between Yangon and Bagan (Train Nos 61 & 62), which takes at least 18 hours. The trains have a sleeper car and also 1st Class and Ordinary Class seating. Between Mandalay and Bagan there are two daily services each way (Train Nos 117,118,119 & 120) that take at least 8 hours. The trains have 1st Class and Ordinary Class seating. Overnight buses and cars also operate to and from Yangon and Mandalay taking approximately 9 and 6 hours respectively. An 'express' ferry service runs between Bagan and Mandalay. Following the Irrawaddy river the fastest ferry takes around 9 hours to travel the 170 kilometres. The service runs daily during peak periods and slower sailings with overnight stops are also available. Bagan's economy is based mainly on tourism. Because of boycotts against the previous military government, the Bagan region's tourism infrastructure is still quite modest by international standards. The city has a few international standard hotels and many family-run guesthouses. Bagan is also the center of Burmese lacquerware industry, which to a large degree depends on tourist demand. Much of the lacquerware is destined for souvenir shops in Yangon, and to the world markets. Moreover, the lacquerware-making process itself has become a tourist draw. The population of Bagan in its heyday is estimated anywhere between 50,000 to 200,000 people. Until the advent of tourism industry in the 1990s, only a few villagers lived in Old Bagan. The rise of tourism has attracted a sizable population to the area. Because Old Bagan is now off limits to permanent dwellings, much of the population reside in either New Bagan, south of Old Bagan, or Nyaung-U, north of Old Bagan. The majority of native residents are Bamar. The Bagan archaeological zone is part of Nyaung-U District, Mandalay Region. ^ "Business: The promise—and the pitfalls". The Economist. 25 May 2013. Retrieved 2018-11-26. ^ "Weather for Bagan". www.holidaycheck.com. Archived from the original on 2013-01-25. Retrieved 2012-02-19. ^ "Weather for Bagan". www.worldweatheronline.com. Retrieved 2014-04-13. ^ a b "Getting to Bagan Myanmar". Visit Bagan. Ministry of Culture, Union of Myanmar (2009). "Royal Palaces in Myanmar". Ministry of Culture. Archived from the original on 2012-08-03. Retrieved 2012-02-19. Ishizawa, Yoshiaki; Yasushi Kono (1989). Study on Pagan: research report. Institute of Asian Cultures, Sophia University. p. 239. Köllner, Helmut; Axel Bruns (1998). Myanmar (Burma) (illustrated ed.). Hunter Publishing. p. 255. ISBN 978-3-88618-415-6. Pan Eiswe Star; Soe Than Linn (2010-02-10). "Archaeologists to assist with Cambodia excavations". The Myanmar Times. 26 (509). Rao, V.K. (2013). "The Terracotta Plaques of Pagan: Indian Influence and Burmese Innovations". Ancient Asia. 4: 7. doi:10.5334/aa.12310. Rao, Vinay Kumar. “Buddhist Art of Pagan, 2 Vols.” Published by Agam Kala Publications, New Delhi, 2011. ISBN 978-81-7320-116-5. Rao, Vinay Kumar (2013). "The Terracotta Plaques of Pagan: Indian Influence and Burmese Innovations". Ancient Asia. 4: 7. doi:10.5334/aa.12310. Stadtner, Donald M. (2011). Sacred Sites of Burma: Myth and Folklore in an Evolving Spiritual Realm. Bangkok: 2011. ISBN 978-974-9863-60-2. Tourtellot, Jonathan B. (2004-09-03). "Dictators "Defacing" Famed Burma Temples". The National Geographic Traveler. National Geographic. UNESCO (1976). Unesco Courier. 28. Paris: UNESCO. UNESCO. "Bagan Archaeological Area and Monuments". UNESCO. Retrieved 2012-02-18. Wikivoyage has a travel guide for Bagan. Wikimedia Commons has media related to Bagan. Bagan Map. DPS Online Maps.